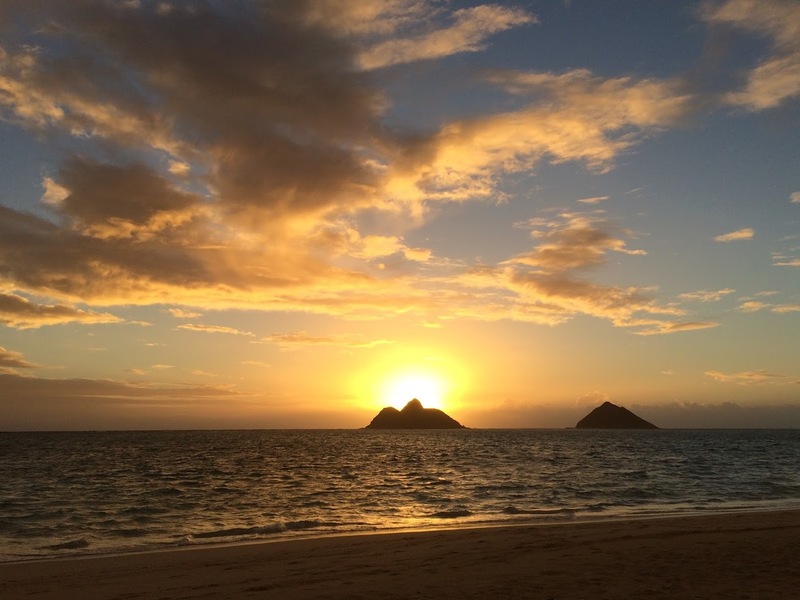 I was walking toward my future self on the sands of Lanikai Beach as the sun rose over the Mokulua islands (a short drive from my house and a favorite spot of mine). She was sitting on a woven blanket, wearing yoga pants and a ponytail, looking healthy and relaxed. I asked her how she got to be so happy and she laughed. I sat with her on the blanket and watched the sun as it grew in strength and color, and I was struck by how peaceful and calm we both were. All I was focused on was the sun and the sand and my breath. Suddenly, she laughed, jumped up, and began sifting through the sand – she had a gift for me but had forgotten where she had hidden it. Finally she unearthed something gold and shiny from beneath a large weather-beaten log. She handed me a golden compass hanging from a chain. I asked her what it was for, and she just shrugged and smiled. For the last three Decembers as a part of Stratejoy’s Holiday Council I’ve embarked on a simple guided meditative journey to meet with my future self. She is always thinner than present me, calmer than present me, and better rested than present me. Her hair is always in a perky ponytail (she’s finally mastered the art of effortless beauty), and she always looks invitingly cozy. The first year she was curled up on the couch in our Tacoma living room wearing a chunky sweater. The second year she was cooking in our Tacoma kitchen, laughing with Jake as he clapped in his high chair. This year she was alone on the Hawaiian shores, soaking in the sunrise, strong and healthy after a year of yoga, running, breathing, and prayer. It’s always such a grounding exercise for me, to let my mind wander and unlock hopes and fears and questions I have about where I will be the following December. The first year, I was afraid I’d never get pregnant, and it was unclear whether the woman I saw was reading on the couch while her baby slept or if she was still waiting expectantly. The second year, I had high hopes of learning how to cook and creating a warm welcoming space for our family to grow. This year, I was afraid to ask whether her husband had returned to her, whether her kids were safely tucked in bed under the protective gaze of their father, so I focused on the only thing I know I can control: myself. The past two years I have been seeking family, coziness, and community; this year I was seeking freedom, self-renewal, a release from the anxiety that binds me. I’m unsurprised I found her on the shores of Lanikai Beach, a beautiful hideaway I first discovered with Tim when we first visited Oahu many years ago. I’ve watched a couple sunrises in my time here and they always leave me feeling more centered, like I’m back to being no bigger and no smaller than I am meant to be. As a Four on the Enneagram, the Individualist, or Romantic, I am what you might call moody, defined by ever-shifting emotions, and motivated by the need to feel heard and understood. No matter the life circumstance, I often feel as though I am missing something – like I lack some fundamental character trait that others possess that allow them to get up every day and live a drama-free life. I often struggle in the tension between wanting to be fully known and fearing that no matter how vulnerable I am with others, I will never truly be loved for who I am. So I withdraw. And I project. And in the confines of my self-protective fantasy world, I imagine a future self who has everything figured out: she has found the mysterious secret others seem to possess, that elusive ability to remain content regardless of her circumstances. She’s calm, unruffled by her ever-changing emotions. She’s free of anxiety and her constant suspicion that others are judging her for being different. She’s self-forgetting and is no longer caught up in the tragic stories from her past or the ideal relationships and accomplishments she dreams about in the future. She just exists. She is connected to her body and she is healthy, happy, whole. This year, I decided my guiding word is breathe. A simple, grounding reminder to a woman whose wheels never stop turning, whose emotions never seem to settle. Faced with deployment, solo parenting, and a lifetime of unknowns, I have finally realized I have got to get a handle on this inner turmoil I have often unknowingly exacerbated. Life is hard enough without trying so hard to emotionally color all of my experiences in the attempt to turn it into an epic work of art. Further study of the Enneagram has helped me identify all the ways in which I am my own worst enemy, the ways in which I’ve been contributing to this pervasive feeling of melancholy for most of my lifetime — but also the ways in which I can choose to (however slowly) make changes. I’ve begun to see that perhaps the future self I dream of isn’t an emotionless yogi on the beach, but instead an integrated, emotionally intelligent woman who is wise enough to know when to act on emotion, and when to let it go. Perhaps the answer lies in her gift to me. Perhaps, I need to remind myself there is goodness and beauty in the world–whether or not it feels good and beautiful. Perhaps, if I work a little harder at attuning myself to all that is true, noble, right, pure, lovely, and admirable*–if I remember I already have the tools to get to where I’m going (even if they are buried deep in the sand)–I won’t worry so much about trying to feel my way to true north.